When I was in my late teens I used to have a great passion for the masculine and steel bodied Iron Man. I used to surf for his wallpapers, pictures and film snapshots and run after Iron Man’s embossed pictured tees. Now even the time has changed I see the same craving in every youngster who yearns for his own superhero. It varies from person to person why a person has liking for a particular character. Some like fictitious heroes; some have their own fantasy heroes, some like Disney superstars while others like Marvel’s superheroes. But what is most common these days is the yearning for the Iron Man (Tony Stark) – a powerful superhero who is on the tongue of every single person out there. Iron Man’s determination, the way he makes his way towards his enemies’ and confronts those with his superpower are commendable. These days there is a vibe for Iron Man 3. All eyes are looking forward to the release of Avengers Iron Man 3 which is May 03, 2013. 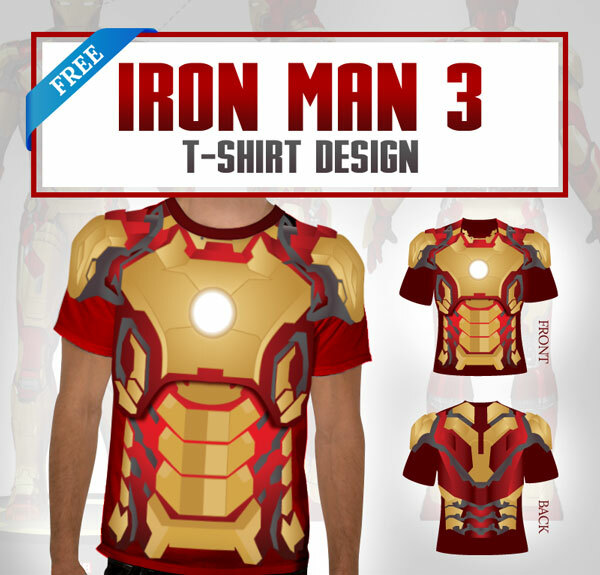 Keeping the huge fan following of Iron Man in view, today I’m bringing along a free Iron Man 3 T-shirt design PSD template which I designed recently for all Iron Man lovers. Get this free T-shirt template printed and make your folks say “awesome”. Cheers! Do subscribe us for more free vectors and other fresh free download graphic goodies. A imagem disponível para compra está em camadas? em pds? It is written that the tshirt is available in Illustrator and it is layered. Change the color, size moreover, both sides are available in premium version.